We're excited to see you at Open House 2019! 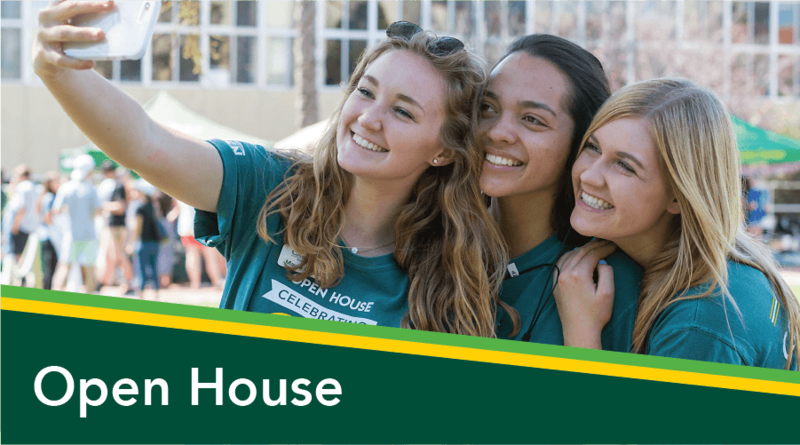 To learn more about what's going on at Open House, how to get here and what to expect, take a look at some of the frequently asked Open House questions below! When is Open House 2019? How can I get the schedule for Open House? If I can't come to Open House, is there another way I can see the campus? How can I get to San Luis Obispo? How can I get tickets for the Rodeo and Tractor Pull? Where should I stay during Open House weekend? Can you please send me information about my major? Are there any family oriented activities at Open House? 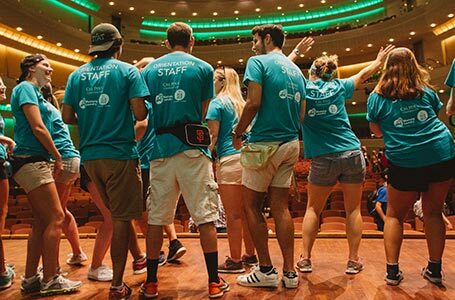 Do you give tours during Open House? Is there an opportunity to visit the residence halls during Open House? I am not an admitted student to Cal Poly, and I just want to see the campus and campus life. Is Open House a good opportunity for me? We can only come for one day, which would you recommend? How do I RSVP for Open House? I registered for myself and my family, but only have one ticket from Eventbrite. Is that okay? How many parents & supporters can attend with their student? How can I request accommodations for a disability? Is there a cost to attend Open House? Once I am on campus where do I park? Are there any other modes of transportation to get to campus? What college is my major under? When is Cal Poly's Open House? 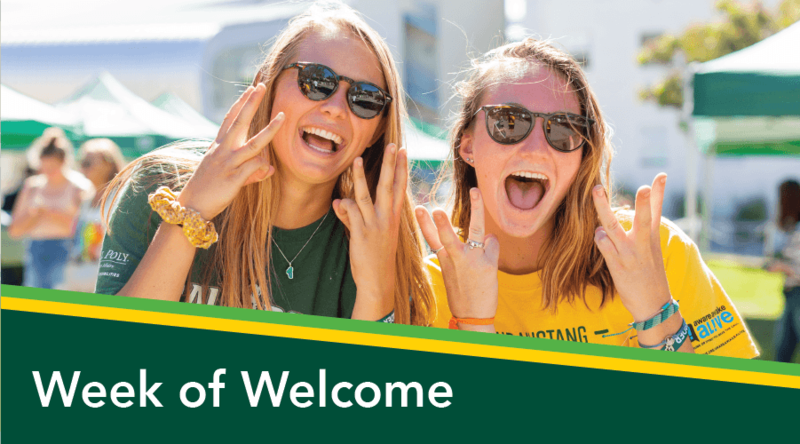 Download the Cal Poly Now app and download the Cal Poly Open House 2019 Guidebook. You will find general info, schedules, transportation info, maps, resources, and much more! You are even able to personalize your own schedule for that weekend. If you head to our webpage orientation.calpoly.edu, and go to the tab labeled 'Open House.' Choose the schedule option in the drop-down menu and you will be taken to a page with options for each day's schedule. On that page you will also find links to other events happening during Open House weekend. Yes! Cal Poly is always open for people to visit. For more information, contact Admissions at (805) 756-2311 or visit their site. In addition, PolyCultural Weekend will be taking place April 5-7, 2019. Guests are responsible for getting to San Luis Obispo. They can fly, take the train, drive, or walk. There are shuttles and taxis from the airport and the train station. For more information, please see our Plan Your Visit page here. How can I get tickets for the Poly Royal Rodeo and Poly Royal Truck & Tractor Pull? Poly Royal Rodeo tickets can be purchased at the rodeo gate or at tickets.calpoly.edu. Poly Royal Truck & Tractor Pull tickets can be purchased at the gate, while supplies last. Cal Poly does not provide housing. The San Luis Chamber of Commerce can be reached at (805) 781-2777 for housing options, or you can view lodging options in and around SLO here. You can also view the hotels that sponsor Open House here. For more information, please see our Plan Your Visit page here. How can I learn more about my major? Are there any family-oriented activities during Open House? Yes! At our Campus Showcase, we have the Kid’s Fair. There is also the Poly Royal Rodeo, Poly Royal Stage, and more! 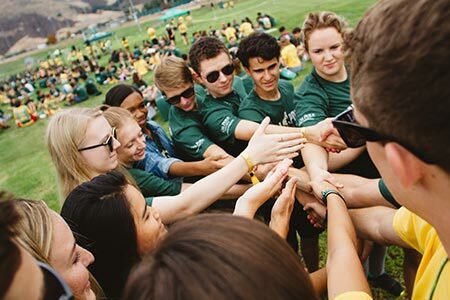 Find more information on our website at orientation.calpoly.edu/open-house/featured-events. 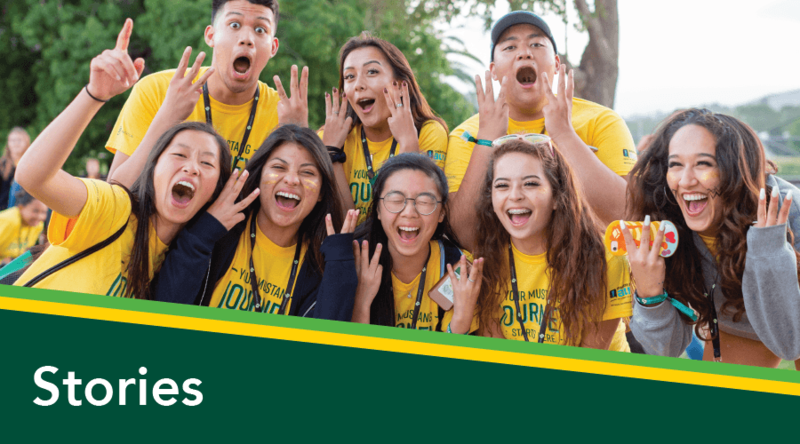 Poly Rep Tours are offered every hour on Friday from 10 a.m.-3 p.m. and Saturday of Open House from 11:30 a.m.-3:00 p.m. Tours meet in the University Union Plaza on Friday and on Dexter Lawn on Saturday. The last tour leaves at 2:00 p.m. each day. University Housing offers guided walking tours of the residence halls, 9:00 a.m. - 4:00 p.m. on Friday and Saturday. Meet on the lawn outside of Sequoia Hall. Open House is a great opportunity to see the campus as well as campus life. Classes are in session on Friday, and Saturday's activities showcase the different departments on campus as well as over 200 clubs and organizations. Friday is directed towards admitted students and their supporters. However, you are still more than welcome to come and visit other events. We can only come for one day, which one would you recommend? 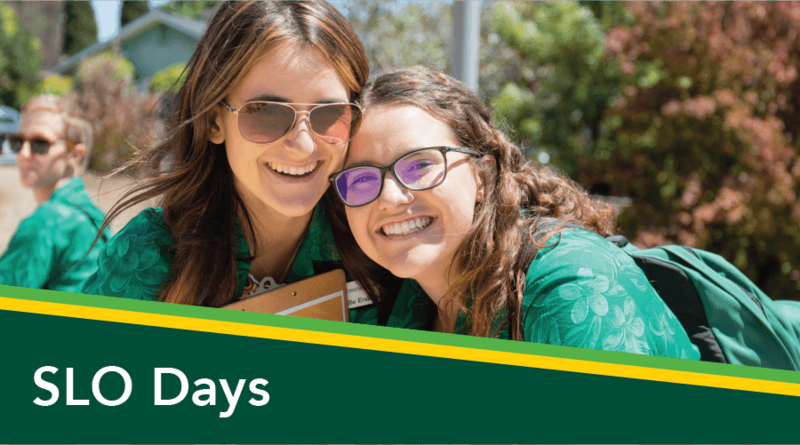 Friday is our Admitted Students Preview Day, a day dedicated to introduce students on the academic offerings of Cal Poly. Saturday is focused on our Club Showcase where over 200 student clubs and organizations show off their achievements as well as sell some tasty food. Each day offers something different for you to explore. How can I RSVP for Open House? If you have any questions, contact us at (805) 756-2400 or at openhouse@calpoly.edu. Yes! When you or your student registered on Eventbrite, we asked specifically for the number of students in attendance – thus the ticket amount being one (1). Later in the Eventbrite Registration, we ask for number of additional party members joining you, this is to ensure the event has the accurate numbers for activities or meals when applicable. Do not be concerned if you only have one ticket for a party size that is larger. We know how many are in your party per the remaining questions on the registration form and we will be prepared for you upon arrival. We are excited to see you at Open House weekend! When registering on Eventbrite, you will only receive one ticket with the student's name. If the student would like to bring parent and/or supporters, the maximum number of parents that Eventbrite will let you register is 5. If you have more than 5 parents and supporters, they are still able to come. Guests with disabilities may request accommodations in advance by contacting the Disability Resource Center at (805) 756-1395. There is no cost required to attend Open House. Some special events during the weekend have their own ticket fees, but there are many cost-free events to attend. Once I am on campus, where do I park? There will be 4 zones designated for guest parking this weekend. There will NOT be shuttles from the parking lots. The only shuttles provided from the parking lots will be for ADA accommodation. Staying in the City of SLO? Take SLO Transit to and from campus, FREE with your Open House registration. Just show the SLO Transit driver your Open House ticket on your mobile device, or a printed copy and you ride free, both Friday and Saturday. Visiting from elsewhere in the County of San Luis Obispo? 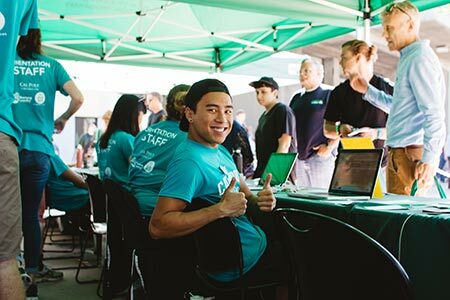 Ride the regional transit (RTA) free on Friday simply by telling them you are headed to Cal Poly. Find and click on your major on this list and your major's college will be there!